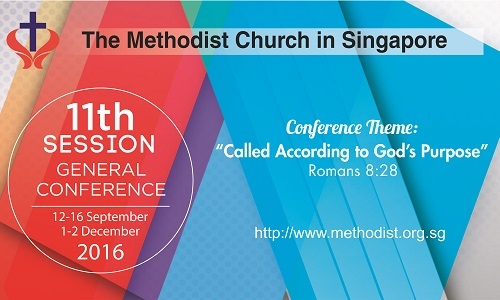 The Rev Dr Chong will be consecrated on 2 Dec 2016 at Queenstown Chinese Methodist Church and Faith Methodist Church, 400 Commonwealth Drive. 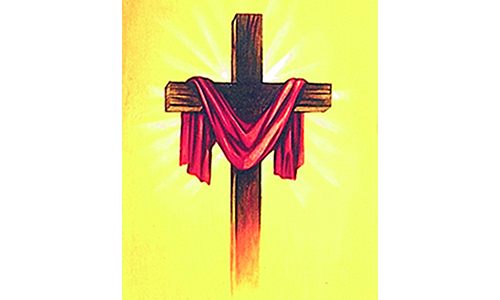 All Methodists are invited to attend the service, which begins at 8 p.m. 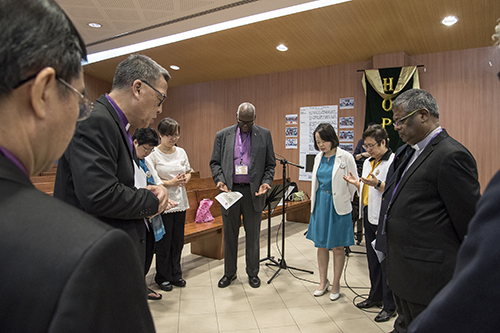 The service marks his taking on the role of spiritual leader for more than 42,000 Methodists – the largest Protestant mainline denomination in Singapore – and succeeding Bishop Dr Wee Boon Hup, who retires this year and was conferred the title of Bishop Emeritus by the GC. 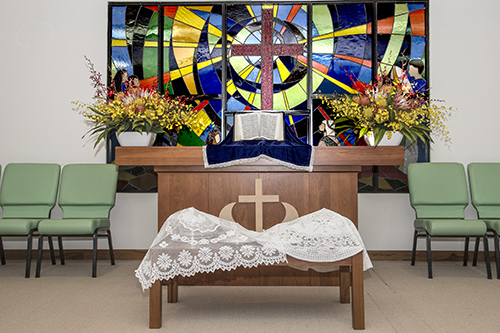 The Bishop noted that the MCS does not have a Council guiding the GC in deciding the Methodist stand on social issues, even though Methodists often ask their pastors what the official position is. The closest we have are the Social Principles, which have not kept pace with changes in our social landscape. He highlighted issues such as “the web of LGBTQI issues” and its related issues about marriage and family, the proper use and abuse of information technology and social media, and inter-faith and inter-ethnic relations. 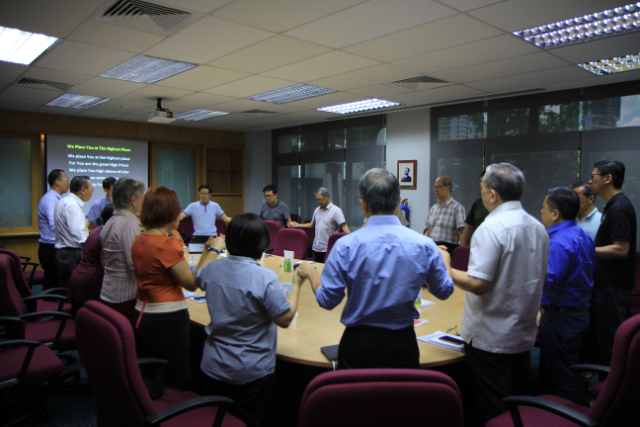 Owing to a lack of understanding of the reasons for raising the level of inter-faith relations, the Christian community in Singapore initially had reservations about whether we were compromising on our faith and the gospel. The passage of time showed that doing so had made us learn “to keep the gospel authentic while engaging those of other faiths with loving sensitivity”. The Bishop also drew attention to other areas of concern. For example, statistics released by the Singapore Department of Statistics indicated that while the number of Christians increased marginally, those who identified themselves as being without religion also increased, and this category included Christians who had grown up in Christian families and had departed from the faith. “We must ask ourselves whether we are preaching the gospel that addresses the causes of this faith-drift”, he added. He emphasised connectionalism, upholding our Methodist heritage and “exploring our Methodist distinctiveness” by tapping on Asian Methodists to speak at our annual Aldersgate Lectures. 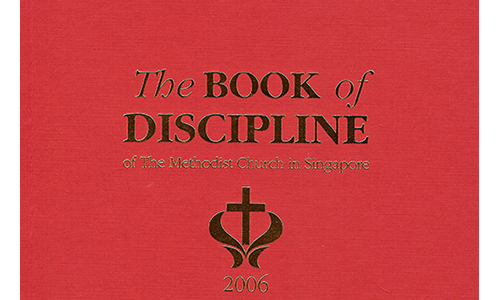 With MCS’ cultural and linguistic diversity, and churches’ physical proximity to and interaction with non-Methodist congregations, equipping Methodists with biblical and Wesleyan undergirding will enable them to make distinctions and decisions about what teachings to accept in the different kinds of theology they are exposed to. He also pointed out a paradigm shift needed in equipping and mobilising Methodists for effective marketplace ministry, instead of merely church ministry. Touching on our mission to the nations, he spoke about cultural sensitivity and “heartware” in partnership with national workers in mission fields, as “humble service, dedication and sacrifice build trust which forms the basis of genuine willingness to learn and apply what we can impart to them”. Eventually, “our goal is that they reach their own people with the gospel”. The outgoing Bishop concluded his address by sharing Matthew 16:18, a key scripture he had been encouraged by. 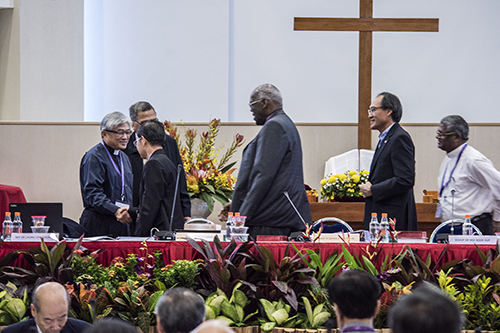 Guest bishops from our global Methodist connection brought greetings and shared meditations at the GC Session: Bishop Ong Hwai Teik of The Methodist Church in Malaysia on 13 Sep, Bishop Warner H. Brown Jr. of The United Methodist Church, USA, on 15 Sep, and Bishop Amat Tumino of Gereja Methodist Indonesia on 16 Sep. 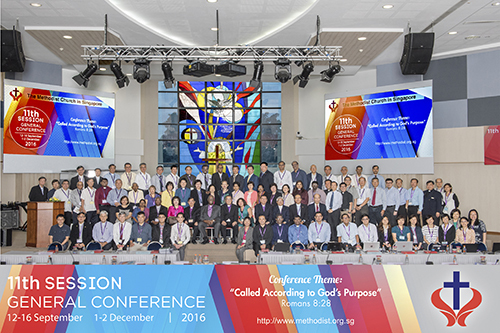 The 11th Session of the GC will continue on 1 Dec 2016. • The Rev Lim Chong Heng, who had pastored in Bukit Panjang, Gloria, Sengkang and Paya Lebar Chinese Methodist churches, and served the Methodist Missions Society (MMS) as a missionary to Chiangmai, Thailand. He passed away on 17 June 2013. • The Rev Ding Bing Hoe, who had served the Lord for more than 50 years and was a dedicated pastor, first in The Methodist Church in Malaya and later the MCS. Many testified that he was a “good man, great pastor, best friend”. He passed away on 23 Oct 2013. • Mrs M. T. Fang née Lee Siew Eng, wife of the Rev Fang Ming Teh. She served outstandingly in the Women’s Society of Christian Service (WSCS) for more than 50 years, in the Malaya Chinese Annual Conference, Asian Central Conference, and GC WSCS (Malaya and later Singapore). 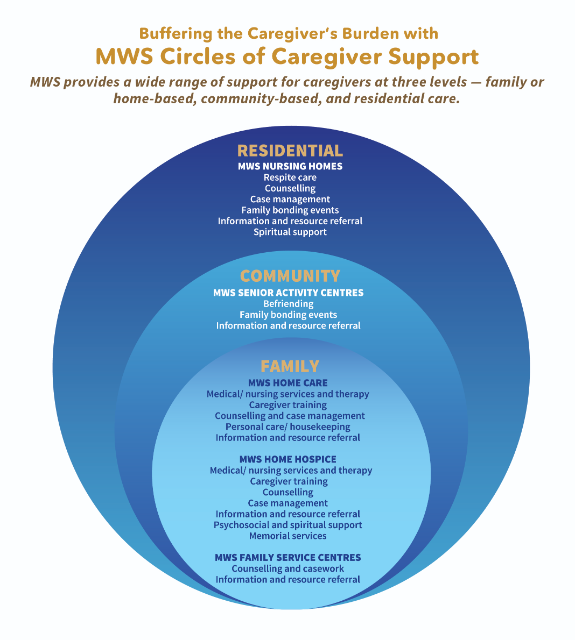 She was also instrumental in setting up Ruth Home. She passed away on 8 July 2014. • The Rev Dr Clarence Lim Kim Seng, who served as pastor in Fairfield, Wesley, Faith, Kampong Kapor and Aldersgate Methodist churches, and was Founding Director of MMS. He challenged the Fairfield MC leadership to establish Yong-en Care Centre as a community outreach to Chinatown. He passed away on 2 Oct 2014. • Ms Betty Ng Gek Heoh, who served as a missionary from Faith MC to Cambodia, and was instrumental in establishing the Emmaus Women’s Centre ministry, overseeing its move from Phnom Penh to Angsnoul Village and adapting the curriculum. She passed away on 17 Nov 2015.
are the Editorial Executive and Assistant Editor at Methodist Message.